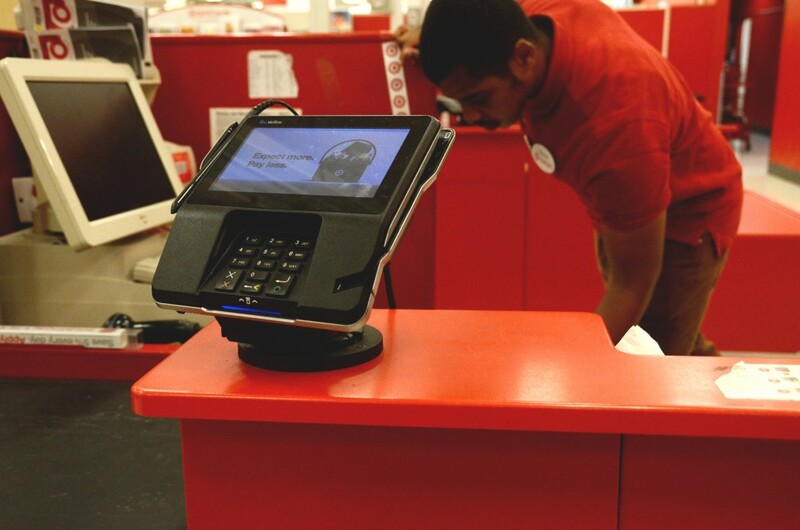 Target has updated payment terminals in its stores to allow customers to pay with EMV chip cards. According to a press release, the company has “been working for years to bring guests this secure payment technology.” SHFWire photo by Rebecca Anzel. WASHINGTON – Credit card security in the United States is finally catching up to Europe, Asia, Canada, Mexico and South America, industry leaders said. For years, these regions have been using EMV (Europay, MasterCard and Visa) chip cards to process payments in a manner more secure than the magnetic stripe cards used in the U.S.
“The U.S. is the last sizeable market to move, and we are the biggest recipient of counterfeit fraud because most of the other big markets around the world have already moved,” Kim Lawrence, financial consumer products executive from Visa, said. Magnetic stripe cards allow hackers to take stolen credit card information, create card copies and use them in stores, Cayan CEO Henry Helgeson, said. Cayan sells payments technology. However, the chip in an EMV card prevents that by using a different code for each transaction to validate the card’s authenticity. This industry shift comes after data breaches at huge retailers, including Target and Home Depot. For consumers, the shift is simple – they need to activate new cards when they get them. For merchants, though, the shift requires the use of new payment terminals, updated software and compliance with liability rules that went into effect Thursday. Those rules state that banks will be held responsible for fraudulent charges if they have not provided their customers with EMV chip cards, and merchants will be held responsible if they do not have payment terminals that allow shoppers to use the EMV chip cards. Deanna Karhuniemi, vice president of EMV Strategy at Chase Paymentech, said the liability shift applies only to transactions that occur in person – not online. Merchants bear liability for online fraud. Large merchants such as CVS and Target have the new payment terminals in stores. Smaller merchants are slowly making the transition more slowly. Sam Danesh, owner of Print Express in downtown Washington, said he has a new payment terminal from Citibank but only one of his customers has paid with an EMV chip card. After traveling in Europe, he said he found the EMV chip cards led to faster transactions.